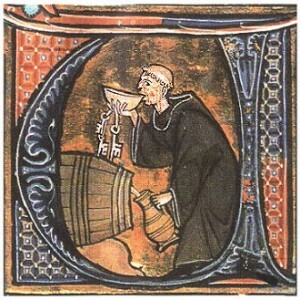 From and old manuscript page, a monk enjoys his own wine. Calabria is known for its hearty local wines. The food in southern Italy is hearty and makes use of the fruits, vegetables, meats and fishes that are local and in season. 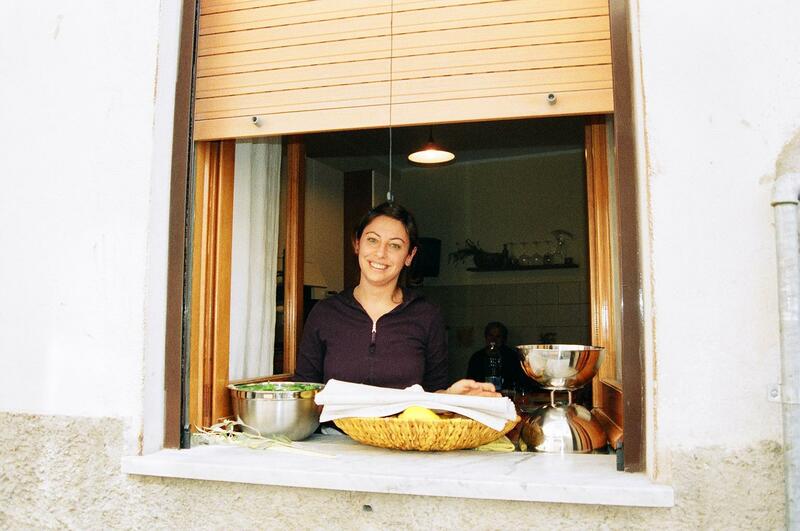 It is different – much heartier – than what you find in northern Italy, Rome, or even Naples. Calabria is a land of fragrant citrus orchards and vast fields of vegetables, ancient olive groves, and terraced vineyards. Its traditions remain ancient, too: here women still roll pasta dough around river reeds and knitting needles to produce their specialized hollow macaroni called bucatini. 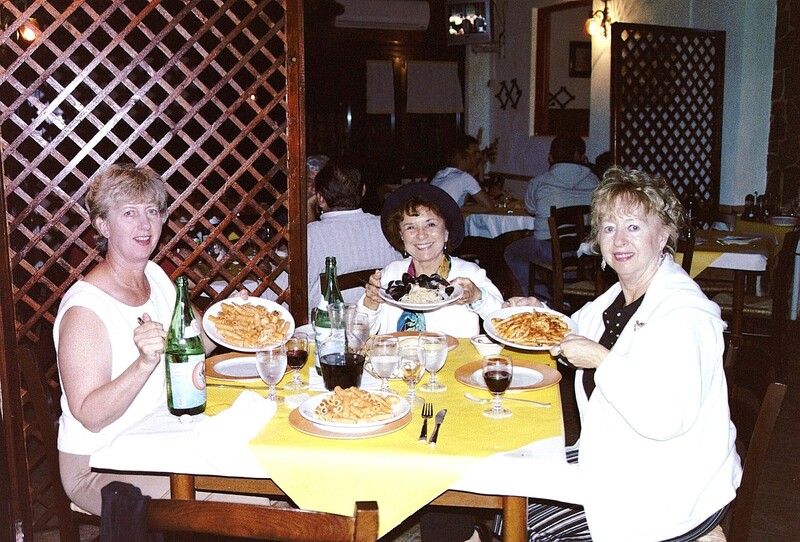 An evening meal with friends in Monterosso. In Calabria, you will find subtle reminders of French country hunters’ cooking, as well as North African influences in the use of pomegranates, figs, almonds, sultanas, clove, saffron, cinnamon, and nutmeg, in some recipes. Not to mention capers and olives. Everything that can be, is, cooked with them, and it is a triumph. The events of past centuries have left their mark as the flourishing Greek colonies once residing here passed their traditions down to the Normans, who were influenced by the Saracen cuisine, and then absorbed the greater Italian cooking traditions of pasta and tomatoes, once those were introduced. 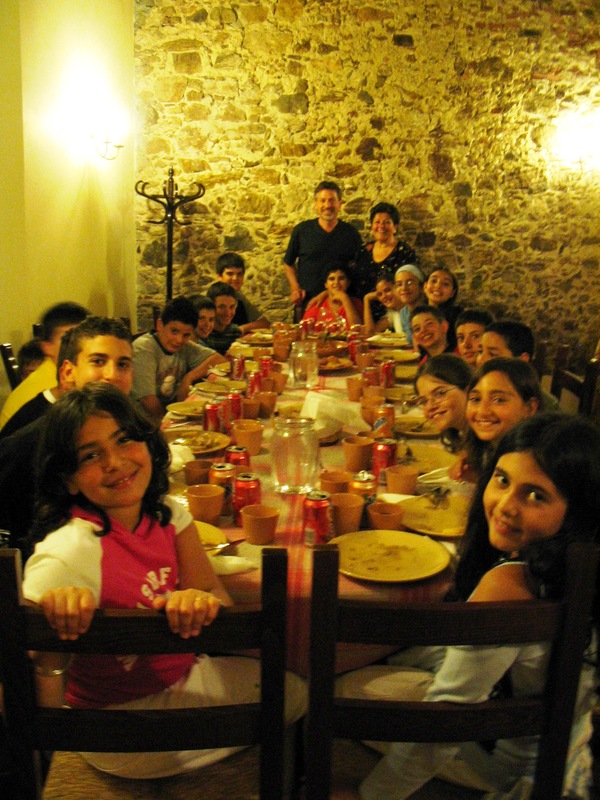 The cuisine of Calabria can be slightly exotic and oh so delicious! Of course, one can always eat in one's home. A meal in Casa Serena. But mainly, the more exotic meals will be served in homes. Most meals in restaurants will favor a more modest palate. Most meals both in homes and in restaurants will consist of several courses and these will be small, but very plentiful – so beware. 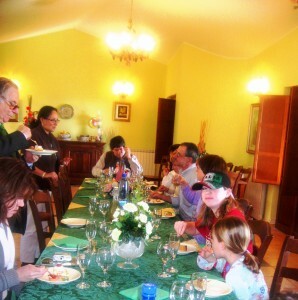 In a restaurant, it is easier to control the number of courses, but not so if you are invited into peoples homes. However, don’t be shy if this latter is the case! Be aware of eating too much of the pasta course, not knowing that you are also going to be served a meat or fish course, a vegetable course, a salad, and a dessert. 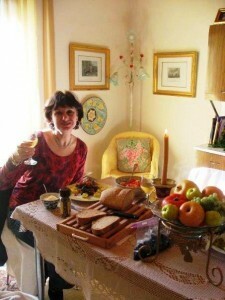 Not to mention fresh local bread and wine. Most cooks are proud of what they can create, and are thrilled if you like it. So enjoy and eat up!! 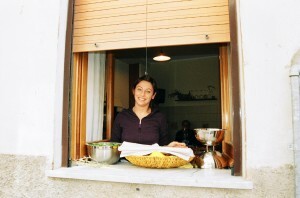 A young Monterosso girl cools the mezzogiorno meal out on her windowsill. 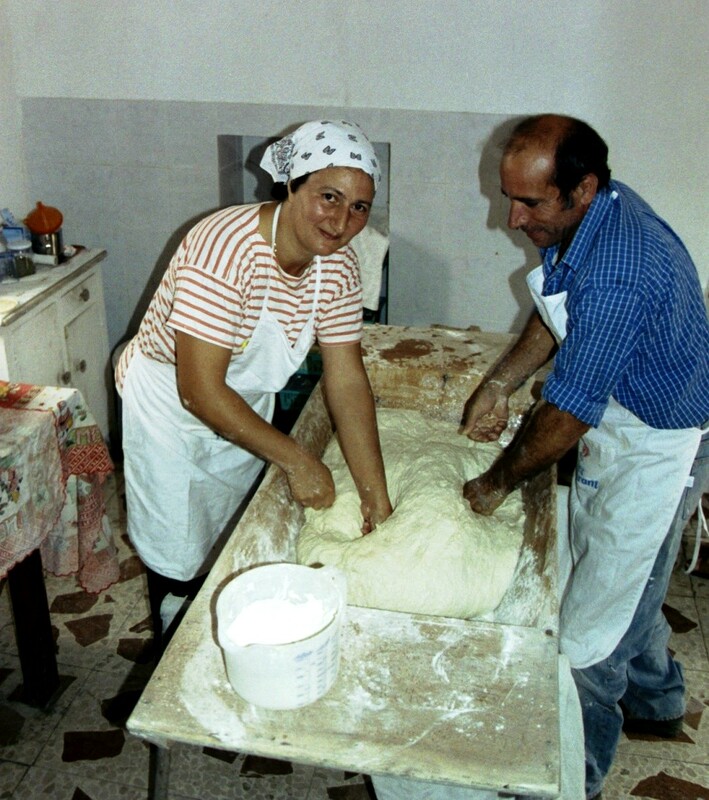 Also, don’t be surprised if, as you wander about town during the mezzogiorno hours, you are invited by a farmer into his kitchen to enjoy a plate of beans and greens that he is cooking in garlic on his small stove. Enjoy with him or her (it will be delicious), and then later, come back with a small thank you gift of ground coffee, sweets, or chocolate. At Sant 'Elia, a meal is served to a group of visiting children. American friends enjoy a meal at Il Ghittone. Il Ghittone is a 15-minute walk to the north of town. Anyone can tell you where it is. It overlooks the valley below and towards the historical center of town, and its balcony seating area affords a pleasant view. Il Ghittone does the local dishes in a very nice setting, complete with white linens and table candles. Here you’ll find homemade pasta with hearty sauces, and huge fresh seafood platters, along with grilled and roasted meats. It features full bar and professional waiters. IL Melograno is Monterosso’s newest restaurant, built from scratch, owned and operated by local residents Graziella and Ottaviano and their children. They make their own bread and pizzas, and are well known for their many delicacies made in the kitchen alongside the dining room. With an antipasto table groaning with these, as well as a variety of Graziella’s well-known local meat and pasta dishes, Il Melograno is also in a wonderful location overlooking a valley of olive trees. Unless you are the hearty type, or want to walk off the night’s fare with a tramp back to town, this restaurant is very short drive from town just beyond Il Ghittone along the same road. On the main commercial street in Monterosso, down the short drop behind the local gas station and bar, is, believe-it-or-not, Madigan’s, an Irish bar (built by a local who visited Ireland and liked what he found). It serves pizza and calzones and a variety of fresh pasta and meat dishes, with, yes, Irish beer, as well as local wines of course. It also features a full bar. It is now owned and operated by the same friendly family who operates the Bar on the street above. Above town, this pizza restaurant is a 30-minute hike up the hill. It does a variety of huge pizzas and calzones in its wood burning oven, all with the freshest toppings. Beer and wine are available. Popular with local families. 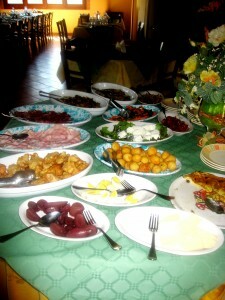 In Villa Velia, Americans enjoy the first course of the evening..., the antipasti. As “agriturismos” both Villa Velia B&B, and Sant ‘Elia B&B, both short drives out of town, offer homemade meals typical of the region. 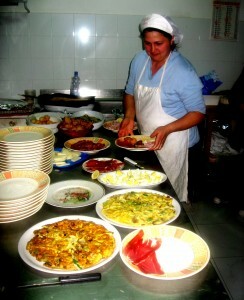 Their cooks use the freshest homemade ingredients, vegetables from local gardens, local breads and fish, etc. In Villa Velia, Velia herself prepares the menus, often with some surprising twists… fried sage leaves for example, meats featuring fruits, typical of the old Moorish ways of cooking in this region, or fresh anchovies in a tortierra (you will never taste a sweeter fish). For contact information, see the Hotels and B&Bs link on this website. You will need reservations for both so that the cooks can be prepared for you. High in the hills above Monterosso is Fosso del Lupo, known for its myriad ways of cooking the mushrooms found in the local forests, as well as its chestnut flour pasta, stuffed with wild boar’s meat (also from the forests) and those same mushrooms. This restaurant is a good 40-minute drive further up in the hills along what can be some very dark roads on a moonless night, but definitely worth the effort. Even Pavorotti, ever the gourmand, made the effort. Below Monterosso, n the way down the mountain toward Pizzo, you will pass a new agriturismo restaurant and B&B, Il Borgo, near Lake Angitola. A pleasant meal can be had by their pool. 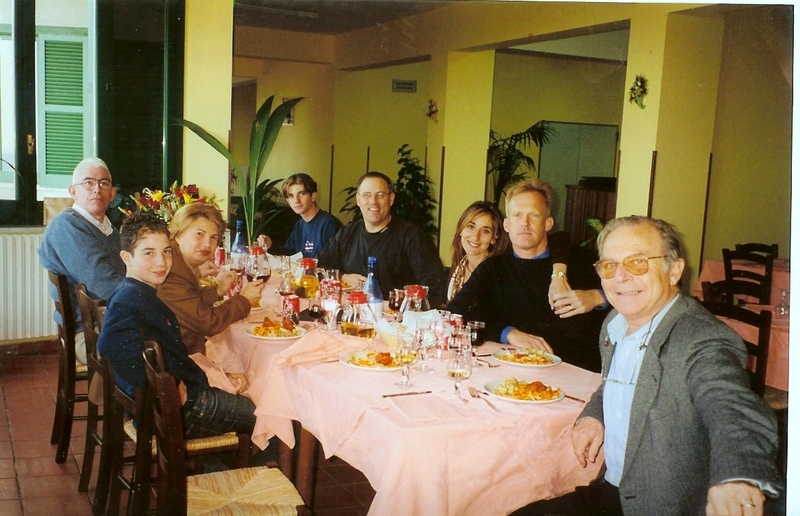 Along the seaside drive toward Pizzo and Tropea, are many seafood restaurants and all can be recommended.